Posted on Mon, Mar 12, 2012 : 7:36 p.m. Even with two less fire stations, Fire Chief Chuck Hubbard says Ann Arbor will be better equipped to respond to fires under a reorganization plan he's proposing. Hubbard said the three-station model will position the city to meet national standards for responding to fires in more areas of the city — though not all. Asked how well the department does meeting those standards right now, Hubbard responded: "Right now, currently? No, we don't do good with that." Hubbard presented his plan to the Ann Arbor City Council during a special work session Monday night. He spoke with AnnArbor.com beforehand and offered an overview. "This plan gives the Ann Arbor Fire Department the best opportunity to meet firefighting standards within the current staffing constraints," he said. "It enhances the safety of the citizens and the firefighters and it's better coverage of heavily populated areas with high run volumes." City Administrator Steve Powers said he's backing the chief's restructuring plan and thinks Ann Arbor will be better served with three fire stations instead of five. "Chuck has done a very good job of looking at different delivery of services, consolidating our resources to better serve the community," he said. "We can still serve the community." 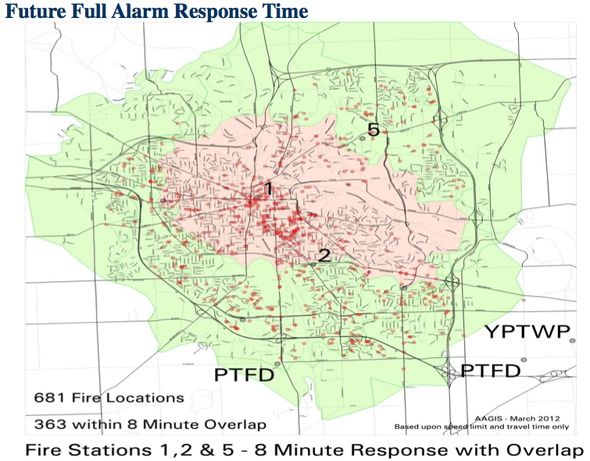 Hubbard's presentation to council included a series of maps of Ann Arbor with the locations of 681 actual fires from the last 10 years plotted as red dots (see maps below). Hubbard's restructuring proposal is aimed at getting the department closer to meeting national standards, including the National Fire Protection Association recommendation that four firefighters should arrive at a fire within four minutes 90 percent of the time, and 15 firefighters should arrive within eight minutes 90 percent of the time. The Occupational Health and Safety Administration's "two in, two out" law requires four firefighters to be on scene before anyone can enter a burning building. 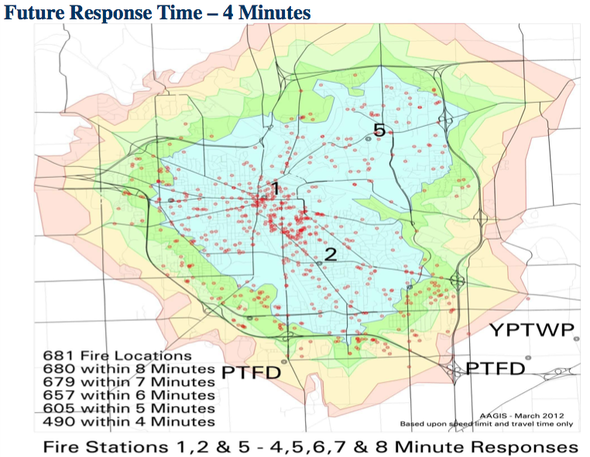 Under the current five-station model, the maps show the city with the ability to get four firefighters on scene within four minutes 36 percent of the time and a full alarm assignment of 15 firefighters in place within eight minutes 40 percent of the time. Under the three-station model, those percentages improve to 72 percent and 53 percent, respectively, which still fails to meet the national standards. "The plan is not perfect, but better," said Hubbard, who pointed out University of Michigan properties would be better protected under the proposed model. The reason three stations are better than five, Hubbard said, is because the city currently only has enough staffing to keep three firefighters on at each of its five stations, with the exception of the downtown headquarters which also has a battalion chief on hand. Under the three-station model, Hubbard said, the department's resources would be bunched up, allowing the department to send, at a minimum, a four-person crew to a fire all at once — instead of two separate three-person trucks coming from different stations. Hubbard said there would be six firefighters and one battalion chief at Station 1 downtown, six firefighters at Station 2 at Stadium and Packard, and four firefighters at Station 5 off Plymouth Road near the University of Michigan's North Campus. In most cases, it would still be two three-person trucks arriving at a fire to meet the four-person requirement in under four minutes, but they'd gain the efficiency of coming from the same station. As far as equipment, the proposed restructuring plan calls for positioning two engines, one tower, one mini pumper and one battalion chief at Station 1. Another two engines and one mini pumper would be kept at Station 2, and one ladder truck would be at Station 5. Powers said the city has no plans to dispose of the city properties where fire stations are expected to close, so the city has flexibility to change course if the plan doesn't work. "If it appears that we're getting there and things are not working the way I think they should be working, that'll be something we'd have to look at," Hubbard said. "Me being in the business for the last 26 years — I've been on those trucks, I've been to many fires, and I know what it takes to do those operations — I'd be really surprised if this didn't work out well." Powers said he anticipates a July 1 implementation of the new three-station model. He said there are some contractual changes in the collective bargaining agreement with the firefighters union that the city will be asking for to assist in making the transition. Powers and Hubbard say they're looking for direction from the City Council on the restructuring plan, but it doesn't require a resolution from council. Rather, it'd be an assumed administrative change as part of the budget for the next fiscal year starting July 1. Hubbard said the restructuring plan isn't designed to cut costs, but rather more effectively deploy the department's existing resources. He noted a new contract with the firefighters allows the department to move to a new 54-hour work schedule, which reduces the number of firefighters off duty each day and allows the city to keep more trucks in service and reduce overtime. The department had been operating on a 50.4-hour work schedule that resulted in more firefighters off duty. Tom Crawford, the city's chief financial officer, said the new contract with the firefighters union that awaits city council approval will increase the fire department's annual costs by about $200,000 next year. The contract includes concessions on health care but an increase in wages and more work hours for firefighters. The blue area of this map of Ann Arbor shows areas where the fire department is currently able to meet the national standard of getting four firefighters on the scene of a fire within four minutes. 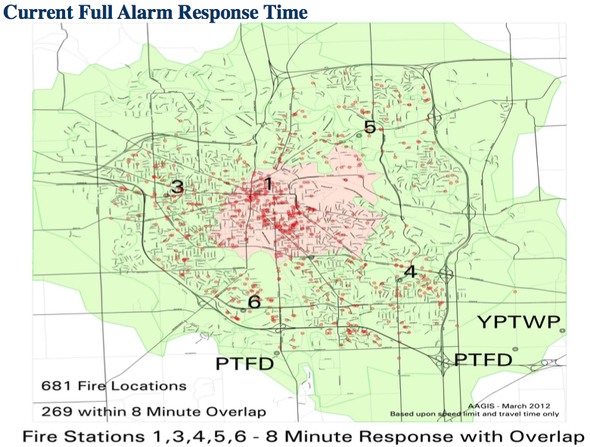 The blue area of this map of Ann Arbor shows areas where the fire department is expected to be able to meet the national standard of getting four firefighters on the scene of a fire within four minutes under a three-station model. The pink area of this map of Ann Arbor shows areas where the fire department is currently able to meet the national standard of getting 15 firefighters on the scene of a fire within eight minutes. The pink area of this map of Ann Arbor shows areas where the fire department is expected to be able to meet the national standard of getting 15 firefighters on the scene of a fire within eight minutes under a three-station model. Wed, Mar 14, 2012 : 4:13 p.m. The citizens have no &quot;experts&quot; to carry their concerns. The city says &quot;here are our experts&quot;. When was the last time someone spoke honest with a citizen group that had no hidden agenda. It is like arguing with your doctor if you are a welder. Who is the most knowledgable. Learn to use a fie extinguisher. Wed, Mar 14, 2012 : 1:24 a.m.
After doing a bit of thinking and rereading the article, it dawned on me. One of the stations he wants to close is the Briarwood station. Correct me if I'm wrong, but that station is the newest out of all. Hubbard wants to reopen station 2 next to Dairy Queen at Stadium and Packard....hey wasn't that station built in the 1950s? Hasn't that station been vacant since 2002? Close the newest station to open a rickety broke down building....hmmm sounds like his high school education works good.....if your in Detroit. It seems Hubbard's model will leave the folks at Pioneer High, Scio Church Rd. area, S. Maple area, Platt and Packard area, Platt and Ellsworth area, Ellsworth and Stone School area hi and dry when they need someone to bring the fire equipment they pay for. Don't any of us realize city hall works for us, and our opinion counts far more when we stand up when they make bad decisions? Hubbard is a mere puppet, a scape goat. City Hall is more concerned about a re-election than anything. They get in there, set up shop and set in motion their pet projects. These projects generally don't concern any of the public at large. We have the power to stop this nonsense. Call city hall, call the fire chief, call Steve Powers, call your council person. The nearest fireman to you doesn't have to be 10-12 minutes from you. In so many cases by the time a fire truck gets to you the fire is so big, or your medical emergency so small gets so big you run the huge risk to die! Correct me if I'm wrong didn't the firemen on the West side rescued two (2) people from a burning home in 2011, and I think they got there within 4 minutes, but they died! How about the house that caught fire on S. State St. near Hoover last year. As described to me, by those on the inside, when the firemen arrived people where running around on fire out in front of the house with one (1) death from that fire. So think here people, less is not more as Hubbard describes. Tue, Mar 13, 2012 : 10:13 p.m.
Tue, Mar 13, 2012 : 7 p.m.
&quot;After listening to Chief Hubbard speak last night as well as taking into the many years of experience he has in the department, I am willing to give him the benefit of the doubt. As I said in an earlier article, he isn't going to do anything that would jeopardize either the people of A2 or his Firefighters.&quot; The bad thing about the above statement is that you seem to be drinking Hubbard's cool-aid. From those I have talked to, to get an idea of what the heck is going on at the fire department, Hubbard is more about himself than anything. Chief Hubbard did more to dodge work and complain about the work and ask why more than anyone thought they would ever see. Just listen to Hubbard speak, he can't make a presentation without stumbling around words, especially while trying to answer a question he has no idea what the real answer is. Info. has it that Hubbard doesn't come up with this stuff, he is fed because he really doesn't know the fire department business. Read the article again, Hubbard wants 3 stations, 6 people, 3 different trucks per station except station 5, and the battalion chief. Look between the lines here, Hubbard is positioning to reduce a fire truck to two (2) people per truck. I haven't seen that since the 1980s from any reputable fire department. The way it looks to me is that Hubbard is going to rely on other fire departments to come and help to make up for the lack of firemen here in A2. So, now that community helping A2 gets a fire call, now they are without their full complement of firemen for those tax payers. Keep in mind, A2 Fire sends their firemen to help other fire departments put out their fires as well, up to 3 fire trucks at once at times go out of A2. So, when they are out who is gonna help us? Someone will get hurt or killed. For Peregrine, the battalion chief does not fight fire. I understand he his the commander of calls because he is usually the most experienced person to keep control of the chaos. Tue, Mar 13, 2012 : 4:32 p.m.
re: Ranzini &quot;..Actually I am both officially now a &quot;Columnist&quot; for AnnArbor.com with a regular column and CEO of a bank. I once heard the definition of the best bank president being &quot;the one who took the most secrets to the grave&quot;. I don't reveal my sources when they ask me not to. Some of these people are afraid, for very valid reasons, of retaliation if they come forward publicly. IMO being an official &quot;columnist&quot; for A2.com and blogging can be construed as a conflict of interest. what is it you want gofigure ? Help solve this problem or just pick a fight with comments which have nothing to do with the subject at hand ? Tue, Mar 13, 2012 : 4:13 p.m.
Well, this certainly is a well thought out plan. First we close a centrally located fire station. Then we cut a lot of public safety personnel. Then we realize that 3 person staffing (yes, they're people not FTE except on paper) isn't good enough to comply with national standards...(nobody outside of Phoenix and New York actually does). So the Chief comes up with a plan that will incorporate these mini pumper things and have 4 FF's working in groups. First problem I see is that station 2 can't go west, for at least a year. Then the borderline areas like the dreaded south end doesn't get covered. Fortunately for the west siders, nothing bad ever happens over there, they are pretty much ignored in this plan. By the way, isn't the briarwood station the most active for calls? When my daughter worked near the mall, she would see them running with lights many times per day and night. Between then senior housing and the densely populated area around the mall, that station always made the most sense to me. It's no wonder that most of the city workers don't live in town. Taxes seem too high for the ever decreasing services. Tue, Mar 13, 2012 : 3:52 p.m.
@gofigure: Actually I am both officially now a &quot;Columnist&quot; for AnnArbor.com with a regular column and CEO of a bank. I once heard the definition of the best bank president being &quot;the one who took the most secrets to the grave&quot;. I don't reveal my sources when they ask me not to. Some of these people are afraid, for very valid reasons, of retaliation if they come forward publicly. Tue, Mar 13, 2012 : 1:53 p.m. I know that some think that this is all a process the mayor is manipulating which will lead to asking Ann Arborites for more taxes when we actually have enough money to fund our public safety shortage. So, I hate to tip my hand and let the mayor know that I am willing to pay more taxes for appropriate coverage. As are many other Ann Arborites that I speak with. Obviously, we don't want to give more if it is not necessary, but we do want our city covered. From the same linked article above it was noted that to cover 30 more firefighters (!) would cost approximately $3 million, or $75 a year for the average homeowner. &quot;Hieftje sounded uncertain there's room in the budget for that kind of extra expense and said he'd be hesitant to ask voters to approve a tax hike. A quick calculation shows a 0.7-mill tax costing the average homeowner about $75 a year could raise more than $3 million.&quot; $75 dollars for the year. Tue, Mar 13, 2012 : 1:43 p.m. I'm tired of the shell game being played. I don't see many people on these forums asking for more public art and less public safety, but that's exactly what we get. You can talk to the mayor and city council until you are blue in the face but they will do exactly as they darn well please. Pretty soon the mayor and his posse will be creating origami art made of dollar bills while we run garden hoses to fight fires at our neighbor's houses, hire private investigators to catch the burglars and rapists, and fill potholes with Quickcrete from the hardware store. Speaking of mediocrity and the continued lack of full coverage: &quot;I'm wondering why you think that's good enough,&quot; Lumm asked the chief, who responded candidly from the podium Monday night. &quot;Well, staffing levels dictate that, so it's not that I think it's good enough — it's working within my means,&quot; Hubbard told Lumm. Tue, Mar 13, 2012 : 1:41 p.m.
Well, apparently you can't say where he lives even though it is public record. At least whenever I do, my comment is deleted. But, I suspect that your guess could be right.... So, regarding the number of firefighters needed to fully staff the five stations, I found these comments by Chief Hubbard from another article interesting and kind of hard to believe: &quot;He said ideally he'd prefer to keep all five stations open and increase the daily staffing levels at each substation from three to four firefighters, and maybe then the department could meet national standards. But he said he'd have to hire at least 30 more firefighters to make that possible...&quot; <a href="http://www.annarbor.com/news/ann-arbor-fire-chief-says-staffing-levels-make-a-big-difference-in-ability-to-fight-fires/?cmpid=RSS_link_news">http://www.annarbor.com/news/ann-arbor-fire-chief-says-staffing-levels-make-a-big-difference-in-ability-to-fight-fires/?cmpid=RSS_link_news</a> He also said the ideal number of firefighters would be 88. &quot;Right now it would be 88,&quot; Hubbard told 2nd Ward representative Jane Lumm, who asked the chief how many full-time firefighter positions he'd like to have in his budget. Tue, Mar 13, 2012 : 1:18 p.m. I guess if you are striving for mediocrity, you will meet your goal. Stadium and Packard Station # 2? Wow...very close to BURNS PARK. Where does the Mayor live again? Tue, Mar 13, 2012 : 2:40 p.m.
actually Peregrine, with the stadium bridge out traffic along packard from main to state and along state from william to the the bridge is a CF at rush hour. The lights are not timed well at packard and state, in fact I don't think they adjusted them to deal with the detoured traffic. Even though a firetruck with sirens going would have the right of way he'd have a heck of a time getting through from the downtown station to stadium/burns park area in four minutes. Tue, Mar 13, 2012 : 1:46 p.m. I was initially surprised by that as well. But under the 3-station model, the fact that Station #2 sits at the intersection of Stadium and Packard allows them to quickly travel east, west, and south which probably puts more properties within the 4-minute region. Take a look at the second map in the article and imagine how the light blue area would change if either the Briarwood or Huron Pkway/Platt stations were to replace #2. Besides, much of Burns Park is likely within the area that Station #1 can reach within 4 minutes. Tue, Mar 13, 2012 : 12:58 p.m. Seriously, it wouldn't matter to some of you if the Fire Department had an unlimited budget. You'd still have something to complain about. However, since the Fire Department DOES NOT have an unlimited budget they have to work with what they have. After listening to Chief Hubbard speak last night as well as taking into the many years of experience he has in the department, I am willing to give him the benefit of the doubt. As I said in an earlier article, he isn't going to do anything that would jeopardize either the people of A2 or his Firefighters. With most of you, it's the opposite of &quot;NIMBY&quot;. Fine, if you want more FF's then find a way to create some revenue to get them. As to the blogger that &quot;has sources&quot;, you are not a member of the Press, Clergy of P.D. so, why don't you tell us who your source(s) is? Perhaps, it's because they don't know as much as you'd like to think they do. Lol, chuck would sell his mother for his own benefit. He is doing just what the mayor says to do. Ask anyone that works there or has worked there. Tue, Mar 13, 2012 : 4:53 p.m.
do you not realize that the fire chief is appointed and has to step in line with hizhoner?? Tue, Mar 13, 2012 : 1:57 p.m. I wonder if you would have the same thought pattern if it was your house that was on fire or you needed medical attention immediately. Hmmmmmm! Tue, Mar 13, 2012 : 12:40 p.m.
Tue, Mar 13, 2012 : 12:27 p.m.
they need more money period.for things like more men and more equipment. Does ART save peoples lives?Don't Think So.Fireman and Policeman DO. The Mayor,City Manager,The Chief are BLOWING SMOKE. Ryan At the very least. Do Powers and Hubbard even live in this town? Tue, Mar 13, 2012 : 12:25 p.m.
Ryan How about a little public service every now and then? Publish the nearest cross street where each council person, the mayor, fire chief Hubbard and Steve Powers live. That way we will know each person that needs to be run out of town IF they support this! I don't expect you will. Even though you have an article every time one of these people blow their nose! Tue, Mar 13, 2012 : 12:48 p.m. Thanks Kim I am not sure why the other addresses are so hush hush. Tue, Mar 13, 2012 : 12:45 p.m.
Tue, Mar 13, 2012 : 11:48 a.m.
Tue, Mar 13, 2012 : 11:42 a.m.
Tue, Mar 13, 2012 : 11:02 a.m. I'd like to see the proposed future coverage map with the locations of the homes of hizzoner, councilmembers, the city manager and the firechief added to them. I live in one of those areas that the plan says that they won't be able to get here in the four minute time frame. The city is closing the fire station that is closest to me. I feel so good when I look at the taxes that I pay and know that the city leadership is leaving me to fend for myself. I will remember this when I go to the polls. Tue, Mar 13, 2012 : 10:25 a.m. The song and dance and cut in public safety makes me physically ill. And note the clever con job of stating this plan doesn't have to be approved by Council or the Mayor. ANYONE on Council who doesn't reject this plan immediately deserves to be recalled. The city needs five fully staff fire station open and for a Council who spends their time on strobe lights and padding the pockets of political supporters with no bid contracts, this is a clear line in the sand for what the core values of Ann Arbor will be. This plan needs to be rejected NOW. Tue, Mar 13, 2012 : 6:59 a.m.
@Peregrine: and WHY is it that I and the experts who are helping me have to come up with all the answers? Why not the Mayor, the City Manager, the City's CFO, members of City Council? It's not so tough. You first determine what your goal is: adequate fire safety for the entire city as defined by scientific best practices (NFPA). Then you determine the resources required to meet that best practice. Then you figure out how to find the resources if you don't have them. This is management 101. In the long run, Ann Arbor must have adequate fire safety to thrive. Tue, Mar 13, 2012 : 2:35 p.m.
you've decided not to run for mayor yet you continue to post like someone running for mayor. I think you need to rethink your decision. People are TIRED of the current mayor. Tue, Mar 13, 2012 : 6:24 a.m.
@Peregrine: to have adequate staffing for the existing five fire stations to meet the NFPA national standards, I am told takes 18 firefighters per shift versus the 15 staffed currently. This would require 12 additional firefighters in total to staff all shifts from current staffing, or 88 firefighters in total. I don't *yet* have the total annual cost of new hires (wages and benefits) under the new contract that takes effect later this year, but to use round numbers assume this is $100,000 per person per year. Then it would cost $1.2 million a year extra. The fiscal year 2013 city budget presentation states that the City Manager and CFO will propose to City Council a revision to the 2013 budget to put what is now projected to be a $1.4 million surplus into the general fund's rainy day fund, so this plan that I've outlined above would cut the amount going into the rainy day fund in fiscal year 2013 to $200,000. See: <a href="http://www.annarbor.com/news/ann-arbor-city-council-fiscal-year-2012-13-budget-outlook/">http://www.annarbor.com/news/ann-arbor-city-council-fiscal-year-2012-13-budget-outlook/</a> I'll be getting more details over time and let you all know when I have them but this is the big picture on what it would cost to properly staff the five existing fire stations and not close two of them. Tue, Mar 13, 2012 : 11:47 a.m.
Tue, Mar 13, 2012 : 2:11 a.m.
@Ranzini: That's so disingenuous. To claim that both the mayor and the city manager told the fire chief not to &quot;trouble us with science, statistics, national standards, or facts&quot; is inflammatory nonsense, and you know it. If you want to be taken seriously you won't engage in such. Since you're apparently not going to reveal who these knowledgeable inside sources are, then you should at least spell out the plan. 1) Where would the three additional firefighters be positioned? 2) How many additional people would need to be hired to fill those three positions? Another commenter seemed to indicate you would need four firefighters per position. Is that true? Would you need to hire 12 firefighters? 3) How much would those hires impact the city's budget? I want the total amount -- salary, benefits, training, etc. You say you have inside sources, so they should know the answers to those questions, and you should put it out there, so others can understand and evaluate such a plan. Tue, Mar 13, 2012 : 2:09 a.m. I remember when the city closed the Stadium and Packard station and the promise of little impact on response times. Granted, budgets have taken a pounding since then, but I've long since stopped believing anything about response times getting better with fewer of anything, be it stations, firefighters or equipment. These changes also assume future fires/station runs will be distributed approximately like previous years. Who would have ever thought we'd need to think &quot;fingers crossed&quot; when it comes to fire protection. blah. Tue, Mar 13, 2012 : 2:01 a.m. Someone correct me if I am wrong please. I do not believe Chief Hubbard even lives in Ann Arbor. Tue, Mar 13, 2012 : 1:54 a.m.
@Kristine: the four people are required to save firefighter lives, as well as citizen's. From the fire chief's presentation (see the link in the story above): &quot;NFPA [National Fire Protection Association, which sets the scientific best practice for fire safety] response standard: four people shall arrive within four minutes 90% of the time.&quot; The two in two out rule is a national standard that protects the lives of firefighters, as there needs to be two firefighters outside to go rescue firefighters who go into a burning building if those inside run into trouble. In case you missed it, please read this for more background info: <a href="http://annarbor.com/news/opinion/ann-arbors-deficient-fire-protection-achieves-new-heights-of-folly/?cmpid=NL_DH_topheadlines">http://annarbor.com/news/opinion/ann-arbors-deficient-fire-protection-achieves-new-heights-of-folly/?cmpid=NL_DH_topheadlines</a> @Peregrine: according to my sources inside the fire department, they know a way to make it work with 18 people per shift, 3 more than the current force available of 15, and don't need 4. I go into the detail on why the plan doesn't meet the standard because this is an important point I don't want people to lose sight of in the discussion. I did read the percentages in the story as you did. My take is that the city manager and the mayor told the fire chief that this is all the staff you will get - don't trouble us with science, statistics, national standards or facts - and based on that amount of money and staff go figure out the least bad plan! Tue, Mar 13, 2012 : 1:37 a.m.
My question for Chief Hubbard, shouldn't the 4-minute, 4-person region for the *current* placement be expanded in your map given that 4 people do staff the Station #1? Does the battalion chief not engage the fire directly? Tue, Mar 13, 2012 : 1:35 a.m.
@Ranzini: Chief Hubbard says it doesn't meet the 90% level. Specifically he's quotes as saying, &quot;The plan is not perfect, but better.&quot; The article itself states, &quot;Under the three-station model, those percentages improve to 72 percent and 53 percent, respectively, which still fails to meet the national standards.&quot; Quit pretending you're exposing a hidden fact. Second, are you claiming that adding 3 more firefighters would allow Ann Arbor to meet the NFPA 1710 standard (4 people, 4 minutes, 90% of the time)? Stations 3, 4, 5, and 6 are currently staffed by 3 firefighters each. Wouldn't at minimum you need four firefighters added, one for each of those stations? Tue, Mar 13, 2012 : 3:22 a.m. Per shift X 3 shifts equals 12 FF.. Love 3rd grade math! Tue, Mar 13, 2012 : 1:16 a.m.
@AJ: Amen! The &quot;experiment&quot; jeapardizing public safety continues! In case you missed this article, when ICMA wrote their report the fire department had 94 staff and has today 76, 18 fewer than when ICMA did the research for its report. What was inadequate then, is extremely unsafe now. Until 2000, when the cuts began, we had more than 120 fire safety employees. From the fire chief's presentation (see the link in the story above): &quot;NFPA response standard: four people shall arrive within four minutes 90% of the time.&quot; The two in two out rule is a national standard that protects the lives of firefighters, as there needs to be two firefighters outside to go rescue firefighters who go into a burning building if those inside run into trouble. 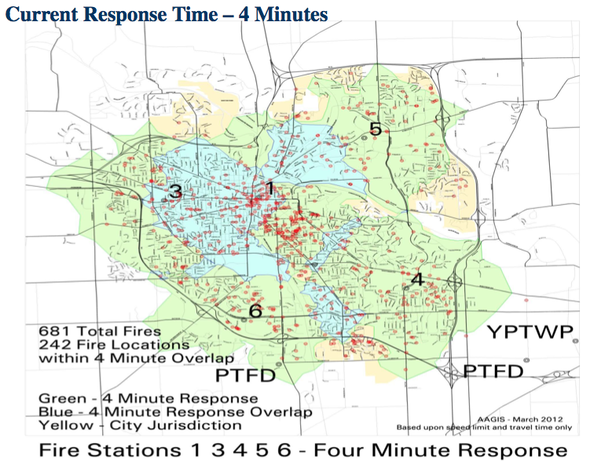 His presentation notes that in 2011 there were 681 fires, but only 480 fires would have been responded to by this plan within four minutes, and to achieve 90%, 613 of the fires would have to be responded to within four minutes. The chief's plan DOES NOT meet the standard he mentions in his own presentation! The proposed budget puts some serious money into the rainy day fund. We need 18 firefighters per shift to properly staff the five stations to meet the standard but have only 15 currently. We should *not* put money into the rainy day fund and hire those firefighters! Then find savings elsewhere to make up any difference. Tue, Mar 13, 2012 : 1:01 a.m. I do not live in Ann Arbor so I have no horse in this race, but looking in from the outside I wonder why they would not take the $1 million surplus from last years budget, plus all the savings they say they are going to have from the new contract and hire\re-hire 12 firefighters. This would give them 4 additional firefighters each day. Every outlying station then could have 4 firefighters on each apparatus. At least this way almost the entire city would have have 4 firefighters arriving in less than 4 minutes. I beleive this way they would at least be able to comply with the 2 in\ 2 out rule and be able to fully perform their job until reinforcements arrive. Tue, Mar 13, 2012 : 12:55 a.m.
&quot;Powers and Hubbard say they're looking for direction from the City Council on the restructuring plan, but it doesn't require a resolution from council.&quot; Well ain't that special! Powers and Hubbard say they do not need council approval! Looks like these two are on a power grab trip! What a joke! The only thing missing is Kwame Kilpatrick! Tue, Mar 13, 2012 : 12:51 a.m. I still don't know where chief Hubbard lives! Tue, Mar 13, 2012 : 12:50 a.m. I'd rather have 3 firefighters at my house in 3 minutes than 4 in six. What are we chasing after here? Saving lives or &quot;making the grade&quot;? I'd like to see a map showing the average increase in fire response time (of any number crew) if this plan goes through. Tue, Mar 13, 2012 : 1:40 a.m.
Tue, Mar 13, 2012 : 12:24 a.m.
Five (5) stations 1 ea North South East West,side 1Downtown You got money to waste on Million dollar urinals and putrid looking art,spent it on the publics safety. Tue, Mar 13, 2012 : 12:13 a.m. I'm sure glad I live in Pittsfield Township. We actually have a fully staffed police and fire department. ALAS, we have no art.